It was an emotional weekend for me, as I'm sure it was for all of you. 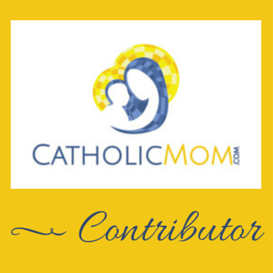 I listened to a bunch of podcasts as I went about errands from The Catholic Insider, aka Fr. Roderick (I just adore him). I subscribe to The Break, one of his other shows, and have for some time, but I just discovered The Catholic Insider. And I loved listening to him reporting in right from St. Peter's Square on Thursday, it made me feel like I was there and a part of everything as well. I'm anxiously awaiting more installments as this historic story unfolds. Henry and I were at JoAnn's yesterday for their Coupon Commotion to gather some supplies and away I went. I've got a whole horde of secret birthday gifts tucked into my at-home knitting bag that I'm very excited about, photos to be revealed at a later date. I'm also working on stuff for the kids' Easter baskets. Henry has been asking me to make him a stuffed crab since Christmas, so I'm working on that now for him. Anne is getting a little crocheted chick. I also want to make Anne an Easter sweater, we'll see if that happens or not, time dependent. I also just ordered Anne a set of saint peg dolls from Cam's shop, because she loves hers that I got her for Christmas. She will be getting the Our Lady of Fatima collection complete with all 3 children. I have an Amazon order planned for my next pay period with books for both kids and a movie for Henry. BTW, I love this designer's work. This chick is a free pattern on Ravelry and on her blog. She also offers a Thanksgiving turkey, a bluebird, and a puppy for free. I bought her wolf pattern and am eyeing up a teddy bear and a bunny. Her patterns are well written, detailed (with lots of instructions on assembly, something that can be woefully lacking in other amigurumi patterns) and adorable. I've been having a great time with them. When I'm not obsessing about the papacy. You know how that goes.